4-Acetoxy-DET is the chemical abbreviation for 4-Acetoxy-N,N-diethyltryptamine and also known as ethacetin, ethylacybin or 4-AcO-DET. 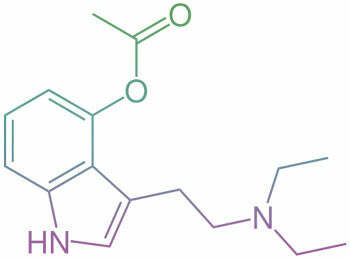 This compound is in a class of drugs called psychedelic tryptamines and is considered to have similar effects to its mushroom and DMT counterparts. It is suspected to be hydrolyzed into 4-HO-DET but cannot be confirmed due to the lack of human studies on the chemical. Research laboratories and independent people choose to buy research chemicals online so they can study the function and behavior of said chemical in a variety of settings. If you decide to buy a research chemical (like 4-Acetoxy-DET) from a vendor (such as Causing Color) you need to be aware of the legality of these compounds within your residing country. This chemical is not for human consumption. If it's accidentally consumed you should call a poison control center immediately due to the lack of studies on how it affects the human organism. While handling this chemical please remember to use gloves and keep it out of direct sunlight and keep it sheltered in a dry, cool, place in order to avoid degradation of quality.